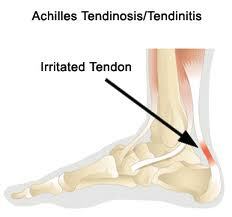 Achilles tendinitis is when the Achilles tendon becomes swollen, inflamed, and painful at the heel. The Achilles tendon connects your calf muscles to your heel bone. It is used for walking, running, and jumping. If you have experienced a sudden “pop” in the back of your calf or heel, you may have ruptured (torn) your Achilles tendon. See your doctor immediately if you think you may have torn your tendon.